This events guide features all the information we have on events in Washington DC. The guide covers theatres featured on this website so you may wish to check local listings for any additional theatre tours available in Washington DC. Enjoy your event! In this guided tour, you’ll discover the details of Lincoln’s assassination and the fate of those involved in that historic event. Stops on the tour include: Balcony and Orchestra levels of the historic theatre; Entrance to the President’s Box, where Booth waited to shoot the President; the historic stage, where you can see the theatre from an actor’s perspective; and the back alley, where you can follow Booth’s escape route. 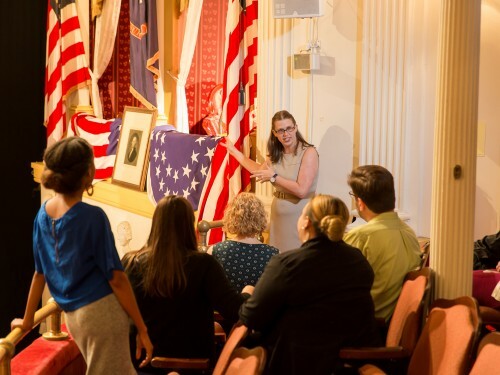 Tours are limited to 20 participants and led by a trained Ford’s Theatre guide with a passion for history. This guided tour covers the theatre only; you may wish to reserve earlier tickets to the full historic site including the museum, Petersen House and Aftermath Exhibits. Length: 1 hour. Recommended for ages 8 and older. Tickets $28.